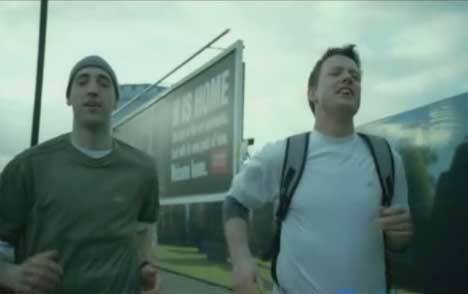 Reebok is promoting its “Run Easy” approach to running with TV ads featuring amateur and professional athletes running at the speed of chat. Their conversations mesh together to create a humorous conversation covering everything from moving to Mars, dating, recipes and unthinkable behavior. Runners in the Reebok advertising campaign include basketball legend Allen Iverson, soccer standout Thierry Henry, track and field stars Carolina Kluft and Aries Merritt, football icons Vince Young, Chad Johnson and DeAngelo Hall, tennis phenom Nicole Vaidisova, acclaimed actress Emmanuelle Chriqui, cricket stars Rahul Dravid and MS Dhoni and street skateboarder Stevie Williams. “Why hit that wall if it hurts? Just run easy,” said basketball legend Allen Iverson. “When I run easy it gives me a chance to take in the sights around me, which makes running a lot more fun,” noted football icon DeAngelo Hall. Reebok’s “Run Easy” television spot was launched on April 30, 2007, online at http://www.goruneasy.com/RunEasy/, and during Canadian broadcasts of NBA basketball, in stadium during Raptors games, and later during the broadcasting of the Mississauga Marathon. The Run Easy TV ad is available on YouTube in versions made for Latin America, Portugal, France, Hungary, Poland, Germany and Italy. The Run Easy campaign was developed at McGarryBowen, New York, by executive creative director/art director Warren Eakins, executive creative director/copywriter Randy Van Kleeck, and producer Suzanne Crowe. 180 Amsterdam creative directors were Sean Thompson and Dean Maryon. Filming was directed by Frank Budgen, Gorgeous Enterprises/Anonymous Content, London, with director of photography Jacques Jouffret, executive producer/head of commercials Dave Morrison, executive producer Cassie Hulen, producer Alicia Bernard, executive producer Paul Rothwell. Editors were Angus Wall and Brad Waskewich at Rock Paper Scissors, with assistant editor Wyatt Jones, and executive producers Linda Carlson and Carol Lynn Weaver. Post production was done at Company 3, Santa Monica, by colorist Stefan Sonnenfeld and producer Missy Papageorge. Visual effects were done at A52 by lead VFX/Flame artist Tim Bird, compositors Justin Blaustein, Mike Bliss, executive producer Mark Tobin, producer Heather Johann. Sound was designed at Machine Head by Johannes Hammers, with producer Vicki Ordeshook. Audio was mixed at Lime Studios, Santa Monica, by Mark Meyuhas, with second engineer Lindsey Alvarez, and producer Jessica Locke.